My parents, some investors, politicians and a large number of journalists seem very concerned about me. I’m one of the renter generation, and everyone seems worried about us because they think we are going to retire without a roof over our heads. Please don’t concern yourself. Yes, it’s true. My wife and I don’t own a house. But we do have a very clear plan for living a happy and secure retirement. For any of my fellow renters out there, here is a simple three step plan for you to do the same. Let’s begin with a few assumptions. I am going to use an example of a 30-year-old renter in Sydney or Melbourne considering buying a home to live in. The assumption is you are 30 years old and are currently renting a home for $700 per week, or $36,400 per year. You and your partner have saved $200,000 thanks to financial discipline and some good investing and now have enough for a deposit to buy the home you live in, or something equivalent. The market price is $1.3m, equating to a 2.8% rental yield, roughly in line with average rental yields in Australia’s two largest cities at the moment. Adding stamp duty you will need a $1.16m mortgage. To pay it off by the time you are 60, assuming a 4.5% interest rate, you will need annual repayments of $71,291 to the bank, or slightly less than $1,400 per week. You’ll also have council rates and maintenance on the house, which I have pencilled in at $8,000 per annum, so a total cost of home ownership of $79,291 per year. The one irrefutable benefit of taking out a mortgage is that you are forced to save. If you want to do better than your homeowning friends, you have to be at least as disciplined. The most important element of our savings plan to is put away the difference between your rent and the cost of owning the same home. In year one that’s going to be almost $43,000 and the early years are particularly important. The rent is going to increase while the mortgage repayments stay the same (see the chart below). In fact, by the end of the 30-year period, our rent is going to be more than a homeowner’s cost of owning a home, but by then we are going to have a big pot of money stashed away. While you are looking at the chart above, let’s end some arguments before they start. This blog post is not about whether you will be better off renting than owning a house. That will depend on dozens of different variables that I don’t have the answers to. The point I’m making is that, if you have the discipline to save those black bars and invest them sensibly, you are going to retire with a big pot of money. Whether it’s bigger than the value of the same house in 30 years’ time, I don’t know. But it will be more than enough to cover the rent. Homeowners get a few free kicks from the tax office but there are plenty of things you can do to keep your own tax low. 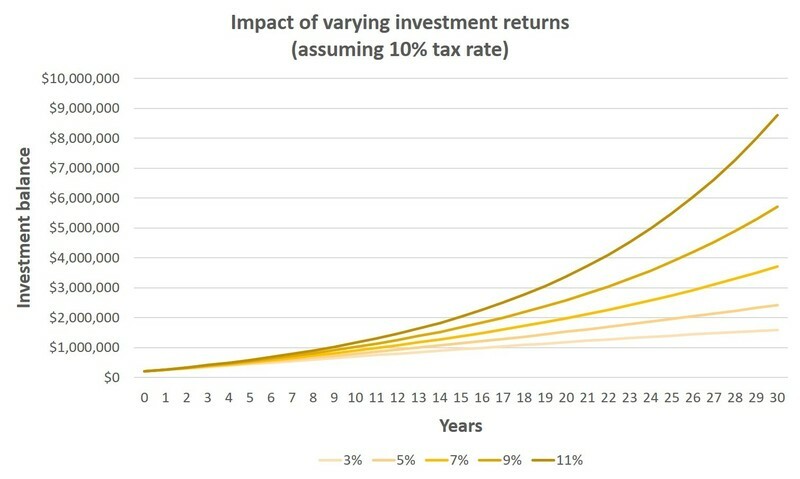 Most beneficially, get your savings into a super fund where the tax rate on long term investment gains is only 10%. I have assumed you can contribute the initial $200,000 deposit you have saved as a non-concessional contribution and keep doing the same with your post-tax savings. You will do a bit better than this if you have room to make more concessional contributions up to your $25k annual limit, but we will keep it simple for the purposes of this exercise. 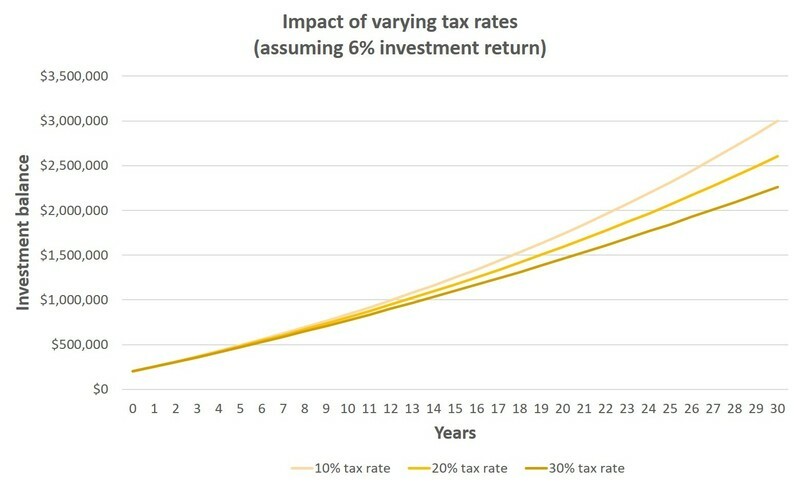 As you can see in the chart below, keeping your tax rate low makes a massive difference to your investment balance at 60. Even if your starting point is a 40% marginal tax rate, if you do your saving outside super, your growing investment returns are going to push you up into the top tax bracket fairly quickly. I have assumed a 10% tax rate but your average tax rate will be even lower if you build wealth in a super fund, avoid realising gains for longer periods of time and generate a good portion of your returns as fully-franked dividends. Cash in the bank isn’t going to cut it. You need your money working for you. Minimise costs, and make sure the portfolio is invested in a portfolio of real assets like shares, property and bonds. You should target total portfolio administration and management costs of less than 0.5% per annum, either through a low cost industry fund or running your own self-managed super fund. And I have assumed a 6.5% gross annual investment return, leaving you with a net return of 6% per annum. This is below the historical returns from most aggressive or even balanced low-cost super funds, but we are starting with high asset prices across the board and I think this is a sensible long-term expectation. The difference between a 7% return and a 3% return is staggering, as you can see in the chart below. At 3% per annum our savings will be $1.7m in 30 years’ time and the annual investment returns won’t go anywhere near covering your rent. At 7%, you will have $4.0m of savings and $160k per annum of spending money over and above your rent. If you can get to an average return of 10% per annum, you’ll have a balance of more than $7m. That’s the power of compounding. Our base case, however, is that you can earn 6% net on your money. This, combined with your annual saving, is going to build you an investment pool of roughly $3m over 30 years. By the time you retire, these savings will be earning you $180,000 per annum before tax, more than double your rent. There are plenty of non-financial reasons to want to own a house: security and flexibility to renovate just a couple of them. And for all I know property prices might keep rising and rental yields falling, meaning the mortgage-free home owner could end up with something “worth” more than the renter’s pot of savings. More importantly, most people I know aren’t capable of saving $3,000 a year let alone $30,000. A mortgage is the financial discipline they need. This post is not to criticize anyone who does buy a house. I simply want to point out that there are alternatives. A life of renting is perfectly feasible. Be as financially disciplined as someone with a big mortgage, invest the money sensibly and you won’t have to worry about retirement. That's all very well, but leverage on a parcel of shares is much more expensive, and risky than a First Mortgage, so returns should be calculated on an equal basis. Excellent Steve. Should be required reading for school leavers. Maybe time to buy a home is when the monthly loan repayment is equal to or less than the monthly rent? I have adopted exactly the same method of saving but now as I come closer to retirement I wonder if I am penalised again by the government that doesn't appear to count houses as assets but does shares when assessing ones wealth ? Good read. This is 101 in financial literacy which sadly, is lacking in the wider community. As the great Albert Einstein is quoted as saying re compound interest; "He who understands it, earns it...he who doesn't...pays it". Great article. I concluded some years ago that it was much cheaper (and safer financially) for us to rent rather than own property in the Sydney market. Unfortunately there's hardly any discussion of this increasingly salient fact in the media. Long term renting will be the best option for most people until this market comes back into some kind of balance compared to rents. 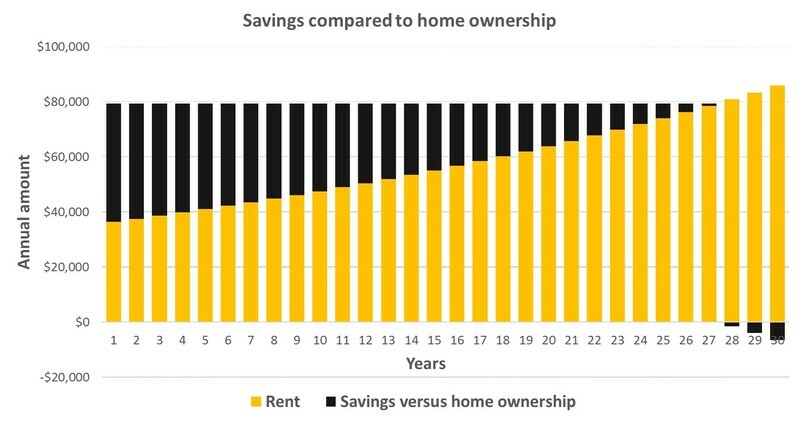 Although this article shows that renting over your productive life is viable, I fail to see how it makes a compelling case for renting v owning, so we must got get the two mixed up. Hi Hayden. We haven't been able to do anything different from others. We were kicked out of a place a couple of years back and moved to a better place 200m down the road. A hassle but a weekend's worth of hassle. We don't have children and neither of us have any interest in spending our weekends renovating ... so uniquely placed to be long-term renters. Depends who you are leasing from but my guess is a financial owner would be open to something longer as long as you were happy to sign up to annual escalation.